Proprietary Name: Painpatrol Professional Pain Relief What is the Proprietary Name? Non-Proprietary Name: Menthol, Unspecified Form What is the Non-Proprietary Name? 64479 - Smartscience Laboratories, Inc.
Painpatrol Professional Pain Relief with NDC 64479-200 is a a human over the counter drug product labeled by Smartscience Laboratories, Inc.. 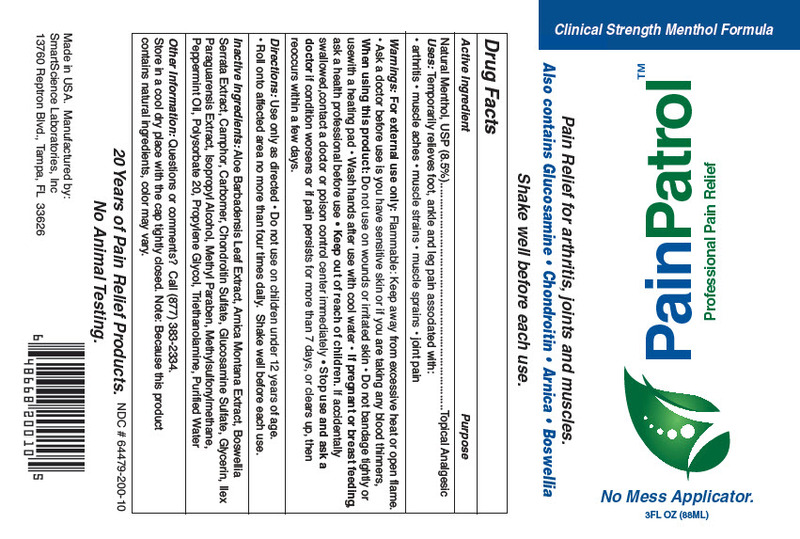 The generic name of Painpatrol Professional Pain Relief is menthol, unspecified form. The product's dosage form is gel and is administered via topical form. Labeler Name: Smartscience Laboratories, Inc.
For external use only: Flammable: Keep away from excessive heat or open flame. Stop use and ask a doctor if condition worsens or if pain persists for more than 7 days, or clears up, then reoccurs within a few days. Use only as directedDo not use on children under 12 years of age.Roll onto affected area no more than four times daily. Shake well before each use. Store in a cool dry place with the cap tightly closed. Note: Because this product contains natural ingredients, color may vary.